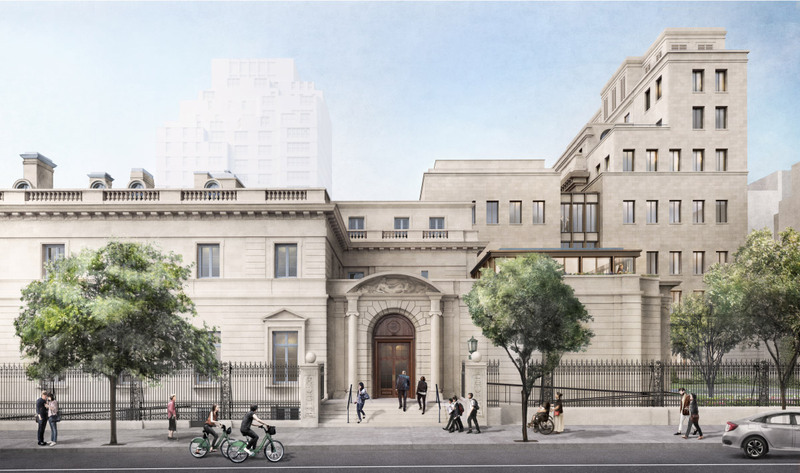 The Frick Collection has further tweaked its expansion plans once again following a Landmarks Preservation Commission (LPC) hearing on May 29, where the commission declined to make a decision at that time. Selldorf Architects and executive architects Beyer Blinder Belle (BBB) have gone back to the drawing board and have released new renderings of an altered scheme ahead of their next meeting before the commission. The latest scheme addresses–or at least attempts to rationalize–some of the concerns that preservationists and the community had towards the initial proposal to modernize the Upper East Side landmark. Several of the changes proposed in May to the massing of the John Russell Pope addition, and more specifically Russell Page’s 1977 garden, drew the most attention. 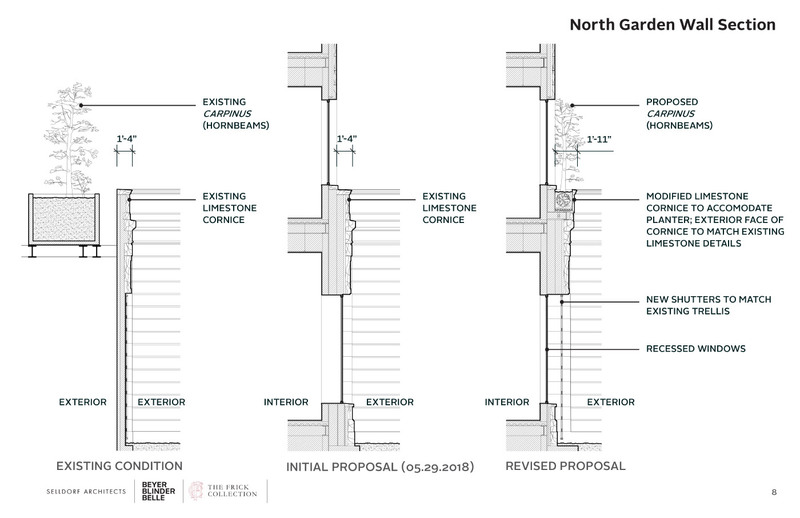 In order to allow more natural light into the revamped conservation areas, Selldorf and BBB had originally proposed adding a topper to the northern wall of the Russel Page Garden. 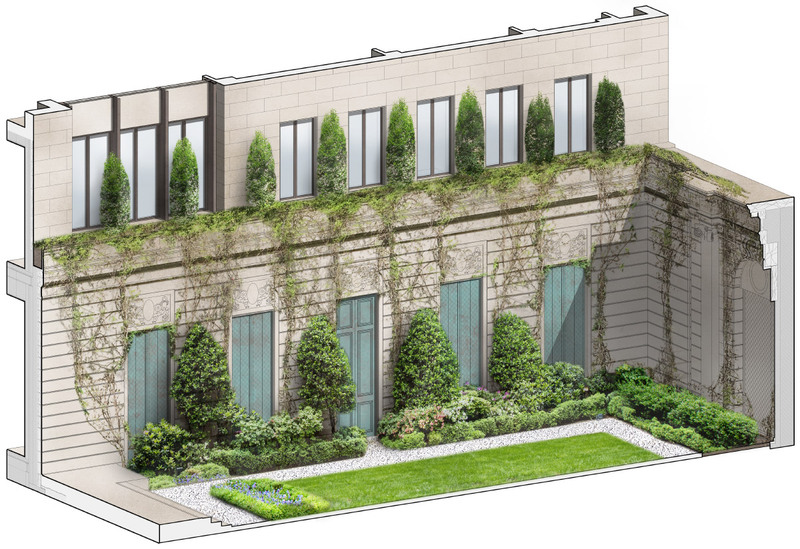 This will require rebuilding the section and removing the smaller trees planted on top of that wall, dismantling Page’s late addition of a trompe l’oeil garden designed to hide the backs of the adjacent, non-Frick buildings. The revised plan would instead see hornbeams, the same type of tree currently in use, planted behind a modified limestone cornice above the new ground floor windows (which have had operable shutters added to match the existing trellises). The locations of the new trees would attempt to hew as closely to the original plan as possible. The Frick’s plan to dismantle the first floor Music Room and install a special exhibitions area were also elaborated on after preservationists decried the potential loss of auditorium. 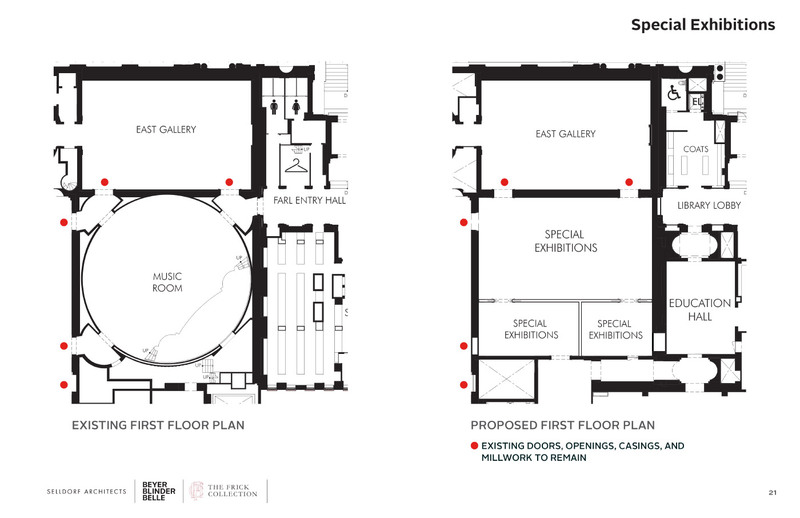 In notes included with the new scheme, the team explained that the Frick’s mission has always first and foremost been the showcasing of art, and that the conversion of rooms into gallery spaces has historical precedent. The poor acoustic qualities of the auditorium for amplifying speech was highlighted as particularly problematic, as the space is primarily used for holding lectures. The Music Room, if demolished, would be preserved via a 3-D laser scan and photographic survey, with the information added to the Frick’s archive. A modern below-grade auditorium would replace the Music Room and provide more space for lectures, concerts, and other engagements. The room’s wood floor and non-structural wall sections would be preserved in the archive as physical artifacts. The Selldorf/BBB team used the opportunity to further elaborate on their plans for expanding the Frick’s subterranean programming. The underground mechanical systems would be upgraded and consolidated and replaced with new gallery and special exhibition spaces, as well as extra back-of-house areas for the staff and new conservation areas. The team explained that their options when planning the underground portion were limited by the site’s plantings and the difficulty associated with creating new required egresses; it wasn’t possible, or desired, to cut new exits into the museum’s gardens or gallery spaces. AN will follow up on this story when information regarding the next LPC meeting becomes available; the item was originally scheduled to be heard on June 19 but was rescheduled. The full presentation is available here.